Canada’s decision to host the Women’s World Cup in 2015 has come during a time in which the sport is on a major rise around the country. Despite popular belief, soccer has actually overtaken ice hockey for the most popular sport amongst youth in Canada. According to the 2014 Canadian Youth Sports Report, 767,000 children from ages 3-17 play organized soccer, while only 531,000 play ice hockey. This stat makes it the number one team sport in Canada for children 3-6, 7-12, and 13-17. It is also the most popular team sport in all regions, including British Columbia, The Prairies, Ontario, Quebec, and Atlantic Canada . Some may wonder where soccer’s recent popularity has come from. To begin, soccer is more affordable for parents than many other team sports. Averaging equipment expenditures as well as fees for leagues, teams, and lessons, soccer was said to cost under $700 per year for each child. Ice hockey, on the other hand, was noted to cost around $1,200. Soccer’s relative inexpensiveness enables more children to get involved and begin developing a passion for the game at a young age . In addition to the cost factor, parents also noted that soccer is associated with “fun,” while other sports like hockey are considered “easy to be injured in” and can often be associated with “pushy parents”. An influx of immigrants into Canada has further boosted popularity, as soccer is the preferred sport amongst first-generation Canadians . With respect to girls and women, the CYSR reveals that 50% of Canadian parents believe that soccer is “good for girls.” It is also the top team sport for girls, not only boys . In a July 2014 article, Toronto writer Michael Murray points out that technology is one of the biggest factors for why soccer has become so popular in Canada. He states that technology has made soccer games more accessible to fans around the world, especially those in Canada. On top of that, Internet has made highlights and other clips of great plays readily available to Canadians . In 2014 the Canadian Soccer Association released its strategic plan, titled LEADING a Soccer Nation, to the general public for the first time. In it, President of CSA Victor Montagliani says that, “there has never been a more exciting time for Canadian soccer” . Investing in TECHNICAL LEADERSHIP entails improving the Long-Term Player Development (LTPD) program that will continue to enhance players’ skills and encourage life long participation. The association has also made plans to develop a National Player Development Pathway that identifies elite players and exposes them to scouting networks. In turn, this will determine the players who can bring the most to the national teams on a global stage . In order to ensure CONSISTENT, WORLD-CLASS PERFORMANCES by our National Teams, they are looking to increase the number of playing opportunities for their elite players. They want them playing at the best facilities and against the best competition in order to accommodate their high performances . 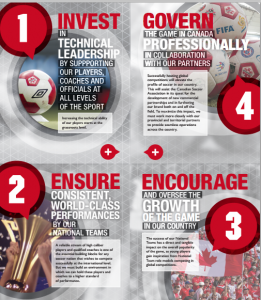 By ENCOURAGING and oversee the GROWTH OF THE GAME in Canada, the CSA can ensure that popularity will continue to grow. If youth players see successful national performances, they will gain role models that will keep them attached to the game. Furthermore, their hosting of the 2015 Women’s World Cup will increase fandom across the entire country as matches will be played from coast-to-coast. On top of that, the facilities that are being built will leave a legacy for future generations to utilize. As General Secretary Peter Montopoli says, “hosting one of the most prestigious sporting events in the world will act as a catalyst for the growth of soccer in our country” . Lastly GOVERNING the game will allow the CSA to continue improving business relations and working towards a more seamless structure that connects national and local levels of the association. It will also help increase communications with other organizations like CONCACAF and FIFA, and boost social media and communication networks . 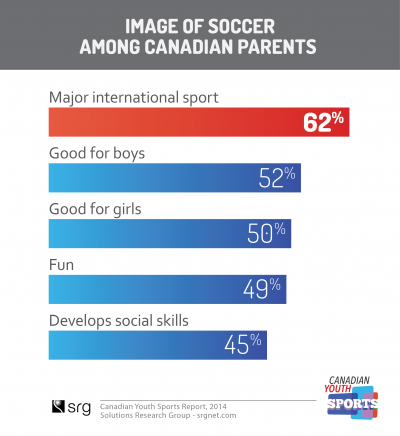 The stats from the CYSR and the 2014-2018 Strategic Plan reveal how far soccer has come in Canada. Although it has been a popular sport amongst youth in the nation for a long time now, their developments have finally put their national teams on the world stage (specifically women). From its creation in 1986, the women’s national team has slowly become a “global powerhouse” . After missing both the 1991 WWC and the 1996 Olympics, the team has come on strongly as a result of the remarkable growth of grassroots soccer for young girls at the turn of the century. This drastic improvement is evident through their performance in the 2012 Summer Olympics, where they were able to earn a Bronze medal . The decision to host the upcoming 2015 WWC, and their plans to successfully prepare and submit a bid to host the 2026 Men’s World Cup will only continue to develop the popularity of the sport in the country. By doing so, Canadian soccer will inevitably improve in the near future. How to cite this page: “Growth of Soccer In Canada” Written By Spencer Davidson (2015), World Cup 2015, Soccer Politics Blog, Duke University, http://sites.duke.edu/wcwp/world-cup-guides/world-cup-2015-guide/why-canada/growth-of-soccer-in-canada/ (accessed on (date)). 1. Srgnet.com. ‘Massive Competition in Pursuit of the $5.7 Billion Canadian Youth Sports Market’. N.p., 10 June 2014. Web. 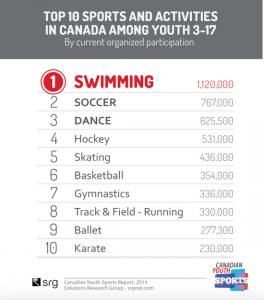 Accessed April 13 2015. http://www.srgnet.com/2014/06/10/massive-competition-in-pursuit-of-the-5-7-billion-canadian-youth-sports-market/. 6. Murray, Michael. “How Canadian Soccer Fandom Got Cool.” Ottawa Citizen. N.p., 16 July 2014. Web. Accessed 14 Apr. 2015. http://ottawacitizen.com/sports/soccer/international-soccer/how-canadian-soccer-fandom-got-cool. 7. Canadian Soccer Association. 2014. Leading a Soccer Nation: Strategic Plan. Accessed April 20 2015. http://www.canadasoccer.com/files/CanadaSoccer_StrategicPlan2014_2018_EN.pdf. 13. Ralph, Christopher. “Canada: Global Soccer Power?” Mount Royal Soccer. SB Nation, 30 Mar. 2015. Web. 15 Apr. 2015. http://www.mountroyalsoccer.com/2015/3/30/8290335/canada-international-powerhouse. 14. Hall, M. Ann. The Girl and the Game: A History of Women’s Sport in Canada. Peterborough, Ont. : Broadview, 2002. Print.